We have been fortunate to have filmed some of the best walleye fishing in North America. Traveling to many renowned destination fisheries during peak times. We have experienced incredible walleye bites across the United States and Canada. There are fisheries that have a reputation for numbers of fish and there are the select fisheries that have serious trophy potential. There are big water options like Lake Erie and Green Bay and Bay of Quinte. River and reservoir opportunities like the Columbia River, Red River, Tobin Lake, Fort Peck and Sakakawea. Then there is Budd’s Gunisao Lake Lodge in northern Manitoba which is unique and unlike any other trophy walleye destination for so many good reasons. What was eye opening to me is the sheer number of master angler class walleyes measured and released on this water each summer. 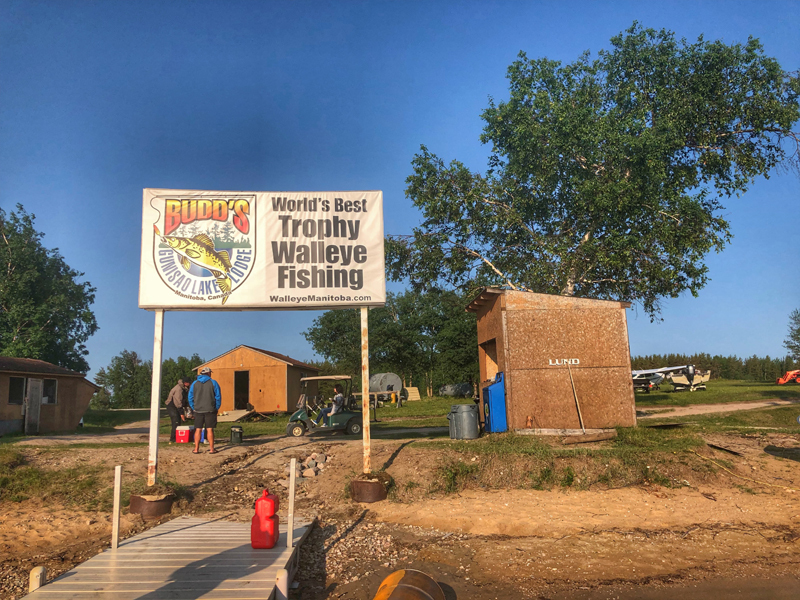 When we look at all the good walleye water in the province of Manitoba, Gunisao typically leads the way for fish over twenty-eight inches. The number of registered walleye over thirty inches on this Canadian shield lake over the past decade is nothing short of amazing. This is a bucket list destination if your goal is to simply catch lots of big fish. 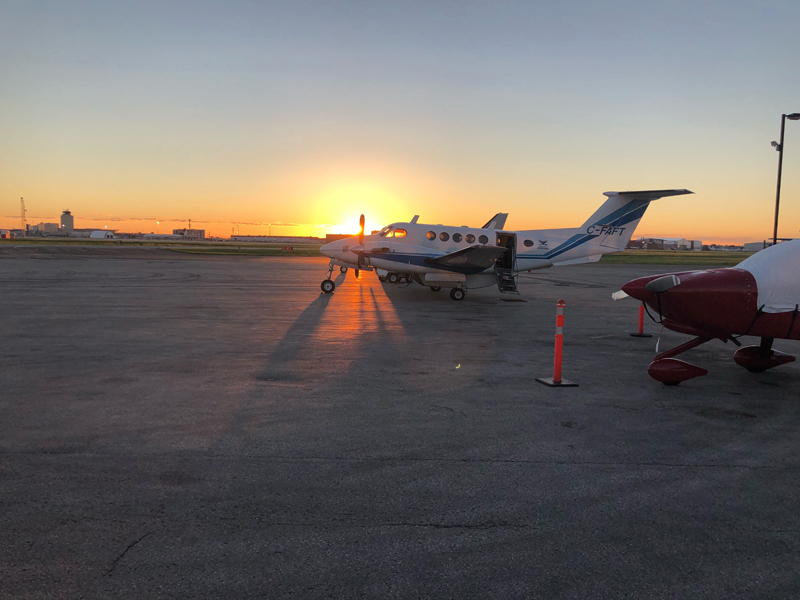 Weekly chartered flights out of Winnipeg and a runway next to the lodge simplifies logistics for anglers. Anglers depart Winnipeg early in the morning and arrive at the lodge an hour and a half later. Staff transports gear and luggage from the plane while the arriving guests enjoy breakfast. Guests are on the water fishing, soon after arriving in camp. We made the trek to Gunisao this past July of 2018. We have done a fair share of fly in outpost camps in the past but this experience was different. Good fishing is expected at a fly in camp and most camps will put you on unbelievable fishing for numbers of fish that range between 15 to 24 inches. Fly in camps offer that ambiance and remoteness along with cut up hands and shore lunches. Gunisao offers the trophy walleye factor. The entire lake can be driven across in half an hour with an 18 foot aluminum boat and forty horsepower motor. The lake is not overly large, not like most big fish destinations. The number of Master Angler walleyes caught each week however is what sets this camp apart from most fly in camps. Budd’s Gunisao Lake Lodge has been owned and operated by the Budd family for over thirty years. 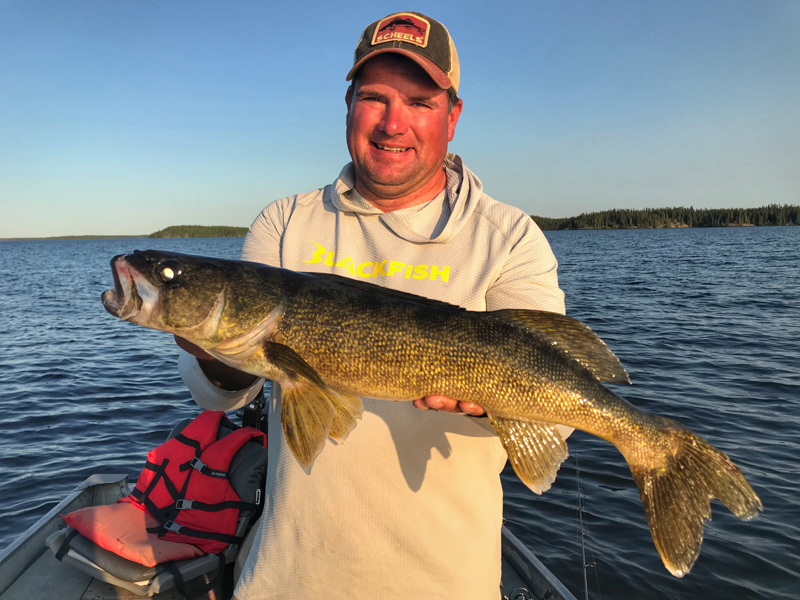 This highly regarded camp has a long tradition of producing big walleye which has been sustained by a catch, photo and release policy that protects these fish. From June through August, you can catch all the fish you want with a quarter ounce jig. If you were to poll most walleye anglers on their absolute favorite way to catch a walleye, most would reply… vertical jigging. Vertically presenting a jig below the boat on classic deep structure like points, reefs and rock bars is exactly how you catch fish on this body of water. 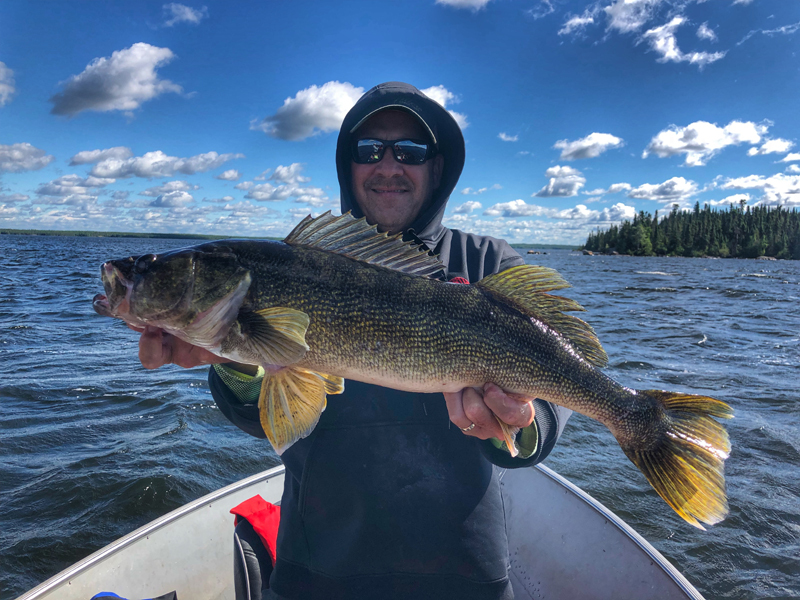 In four days of fishing, we put nine master angler walleyes in the boat but what was also staggering was the sheer number of 24 to 28 inch fish we caught. We typically caught at least sixty fish each day. To add even more enjoyment to the whole experience was that the 24 inch fish fought just as hard as the 30 inch fish. Stubborn, bull dog fights that stretched eight pound mono, bending over a spinning rod right down to the handle. Directly below the boat in twenty-five to thirty feet of water, these big fish refused to leave the bottom of the lake. Good living. 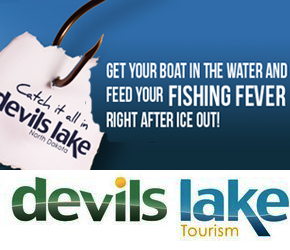 Gunisao Lake in northern Manitoba is one of the Province’s premier fisheries for Master Angler class walleye. The number of 24 to 30 inch walleyes is staggering with fish caught over 32 inches each season. Pictured is Jason Mitchell from Jason Mitchell Outdoors Television. The logistics also make Gunisao stand out. Most fly in camps utilize float planes which add another layer of expense and also are limited by range. This camp actually built an air strip next to the lodge and utilize chartered flights out of Winnipeg. Simply get to Winnipeg and fly out early in the morning. After an hour and a half flight, you are eating breakfast at the lodge and on your way to fishing. No float planes not only simplifies the logistics for anglers but also raises everything else up a notch. This camp uses much larger motors that burn more fuel. The food is excellent. Supplies and staff get transported with each trip. Scott Winkels of SCHEELS registered eight Master Angler walleyes over twenty-eight inches during four days of fishing on Gunisao Lake. Most of the anglers fishing in camp while we were on Gunisao have been fishing this lake for several years. One particular family had been coming up for over twenty years. Once you get a taste of Gunisao, you want more. We visited with several of the anglers in camp while enjoying shore lunches or evening dinners in the lodge. The common theme was simple, “I catch more big walleyes during one week up here than I do the rest of the year fishing back home,” was echoed by several groups of anglers. Each guide boat has a ruler and each guide has an iPad for taking pictures of Master Angler fish on the ruler. At the end of each day, a dry erase board is updated with trophy fish. Each evening, anglers would quietly stare at this dry erase board in disbelief. Gunisao Lake is a special place. The author, Jason Mitchell hosts Jason Mitchell Outdoors Television airing on Fox Sports North and Fox Sports Midwest with some of the highest raw Nielsen Ratings in outdoor programming on Fox Sports. Airtimes and listings along with past episodes can be found online at www.jasonmitchelloutdoors.com.